I remember the first time I plucked then greedily devoured my first garden-grown strawberry. Aside from inwardly beaming with pride at the fact I'd managed to nurture my fulsome plants to delicious fruition, I was knocked back by the fill-the-mouth taste packed by these beauties. The sweet succulence was joined by an almost intoxicating aroma that filled my palate and traveled up and into my nasal passage. I was hooked – I had attained gardener's nirvana! My first brush with growing strawberries was as an enthusiastic teenager. I'd grown them in a mismatching trio of pots and watched them with obsessional eagerness, all the while willing the plants to flower then the green fruits to turn red. With time they did and for four glorious weeks I had a succession of strawbs that marked the beginning of a continuing passion for these most generous fruits. Late spring into early summer is the right time of year to plant bare-root runners that have been cold-stored to hold them back. Brought out of the cold and sold on, they will get away very quickly indeed to give a pick of fruits in as little as two months. Alternatively, you can plant regular pot-sold strawberries which should also bear fruit in the same summer. Set plants into multipurpose potting soil, spacing them 25-30cm (10-12in) apart – this is closer than they would be in the ground as it will be easier to water and feed them. Bare-root runners can look quite severe with their minimal top growth and often less-than-plump roots. This is normal, so worry not! Give the runners a soak in a bucket of water to revive them or water pots of strawberries if they are at all dry. Fill your tub with compost to within an inch of the rim then plant your strawberries so that each crown (where the leaves emerge) sits just above the surface. Firm the plants in and water to settle the compost around the roots. I like to sink empty 7cm (3in) pots into the compost at regular intervals. These act as reservoirs so that by watering into them the water is slowly released at root level rather than running straight off the compost surface. Compost should be kept moist by watering whenever the soil dries out. When watering, try to keep moisture off the leaves to prevent fungal diseases getting a hold and spoiling the fruits. If you can, carefully lift the leaves to apply the water to your sunken pots. Your plants will also appreciate regular feeding with a high-potash liquid feed as soon as the first flowers appear – a brand sold for feeding tomato plants will work just fine for this purpose. Keep your tubs of strawbs in a sunny part of the garden, patio or terrace in order to encourage young fruits to swell and ripen. Developing strawberries can be kept clean of compost by tucking in wood chips or straw beneath the fruits to lift them clear. Drape netting over the tubs if birds start to nab your fruits. After fruiting is over foliage can be cut back to leave just the central, young leaves intact. Runners should be removed, unless you want to propagate new plants, to ensure plants bulk out again before winter. Tubs can be moved into a greenhouse or polytunnel for winter to coax an earlier picking next year. If you have never grown strawberries before then housing them in containers is a great way to start. It's an almost fool-proof option and the rewards are indescribably sweet! Plant, water, feed and pluck then fill your own mouth with the unbeatable aroma of home-grown strawberries. "Brilliant article, thank you for tips. As well as growing in containers I have a patch of ground I'd like to grow strawberries in. Would planting and care be very different? I've heard of these circular copper-infused mats that you can put around strawberries to ward off slugs and snails. They're quite dear, but are they actually worth it? " "Hi Christopher. Growing in the ground is much different. Just plant into fertile soil and, as you suggest, watch out for slugs. I've never used copper rings, but you can if it gives you peace of mind. I would recommend, however, slipping round strawberry discs around the plants. This keeps the fruit from sitting on the soil and rotting/fouling. You can make your own using offcuts of carpet underlay or similar - anything to stop the fruits from being in direct contact with the soil. Keep plants fed with a liquid tomato fertiliser as they come into flower and fruit." "How do I get rid of fruit flies that are all around my strawberries...Help." "Hi Leona. Fruit flies can be a problem on fruits that are lying about, though rarely on fruits that are still on the plant. Harvested strawberries will keep outside of the refrigerator for about three days. You can keep fruit flies off by floating soft mesh over the fruits to deny them access. Or keep them in the refrigerator but bring them out a few hours before eating to warm back up to room temperature so they taste better. For fruits on the plants, be sure to remove any rotting or soft fruits as soon as possible. Water in the morning so fruits are not damp and can dry off before it is dark again. This will reduce the risk of mildew and mould, which can offer an entry point to fruit flies. By keeping on top of plant hygiene you should help to avoid the worst of fruit fly attentions." "Thank you Mr. Vanheems, I appreciate your response. Leona Borge "
"Regarding slugs: I have read elsewhere that, for tomatoes, cutting a toilet-paper cardboard tube down one side and encircling the stem of the plant with it will keep slugs off the tomatoes. The comparable device for strawberries would seem to be a long strip of cardboard 3"-4" wide, snugged around all the stems of the whole plant, and taped or stapled together at the ends. Should also help to keep the little goodies up off of the soil. What says the expert?" "I have never heard of this technique, but I'm always willing to give something new a go, so I'll try this on my strawberries. I imagine that the cardboard is unpleasant to cross, hence its efficacy as a slug deterrent. It will be interesting to see the results." "My strawberry plants leaves have started to curl up and they look like they are dying off ,they are in a tub ,have you any idea why this is happening . " "It could be that you have vine weevil grubs in the potting soil/compost that they are growing in. These eat away at the roots, which compromises the plants' ability to absorb moisture, causing leaves to die back. You can find out more about vine weevils here: http://bigbughunt.com/bug-guides/uk-and-europe/vine-weevil/ Or do the undersides of the leaves have a greyish mould on them? If so they may have strawberry mildew. " "I purchased a hanging container of Ever-bearing strawberries and it is or was beautiful, problem is that some of the leaves are turning yellow and parts are dying off. I water almost daily until it starts to drain out the bottom. The container faces the East and gets sun all morning till around noon. I rotate the container weekly. The strawberries aren't getting big and seem to start to dry out before they are fully ripe. What am I doing wrong? I live in Vermont so it isn't exactly hot here..."
"It could be that the container is too small - or that there are too many plants in it? Also, in Vermont, you would be better off giving them a south or west-facing position so they get more direct sunlight at a warmer time of the day. Are you also feeding them? A liquid tomato fertiliser would work well for strawberries and encourage speedy ripening and good growth." "I have planted some strawberry plants in drain pipes which are about 3feet off the ground,but the majority of the plants have not produced flowers there fore no strawberries ,could this have anything to do with the fact I was advised to cut back any trailers or flowers for the first six weeks so that the roots bedded in.Hopefully if that is the reason next year should be OK."
"Hi John. Yes, that could be part of the reason. Different strawberry varieties flower at different times of year - so if you cut off this season's flowers to help the plants establish (which is a good idea) then you may not get any more flowers this year, in which case you can expect a good crop next year. Keep on cutting back the runners (trailers) so that the plants bulk out and put on lots of growth. In a few years' time you can use the runners to propagate new plants, but for now the pants need to concentrate on establishing." " I have a 6 hanging long baskets that I grow my strawberries in. I have had a good yield of fruit . I live in a very hot part of Australia Perth and keeping the plants from moist is difficult. What I want to know is when the fruiting season is finished do I cut back the plants and then lave them in the containers. Our winter are very rainy but we do have sun most days. Thank you Mary"
"Hi Mary. I'd cut back the old foliage to the new shoots, which will be at the centre of each plant. This will encourage new, fresh growth. As long as you can keep the plants moist, then they will be fine remaining in the baskets, though they may need some fresh compost around the roots when they start into growth in spring. Alternatively you could plant them in a moist spot in the garden, then dig them up again to replant when the new growing season starts next year." "I bought a couple of strawberry plants for my son to enjoy. It's in a pot that faces north so it gets all day sun and it's regularly watered and fed. My problem is that I can't get any maturity with the fruit. Plenty of flowers and then small bud like fruits appear but then they turn brown and shrivel up and die. Do you think the plant needs more fertiliser? Any tips? Thanks in advance. Meredith "
"Hi Meredith. I have to confess that I'm stumped as to what might be happening to your strawberries, as you certainly seem to be looking after them well. Could it be that the compost/potting soil they are in is very old. They may do better in fresh compost. They also need plenty of space, so if they're overcrowded then that could be a problem too. Maybe try re-planting them into fresh compost. Are there plenty of pollinators in your garden - e.g. bees?" "I bought A hanging pot of strawberries it has at less 3 plants in the pot and some runners when I purchase it . It also had started to flower as well. Im watering it daily and I put it out side in the sun so it is getting the sun as it comes up inthe east and then shade for a while then sun later in the afternoon as the sun comes around the bld at 2pm. My question is it has lots of flowers now and some have started to turn into green buds fruit. I want to put the plants into there own pots but I dont know when it safe to do so and not hurt the fruit that is coming now. I live in an Apartment so I dont have a yard to put them in someone told me I could keep it in my apartment live a house plant all year long. what do I do now. Oh I did get some food/fertilizer for it that say to feed it once a week from Miracle Grow." "I forgot to say I bring it in a night as it is still chilly here at night here in Ma. our days get up to 60s to 95 but the night drop down to 38 to 50. I sit it on top of my grill just outside my back door during the day as the grill is still cover from winter now." "Hi Debby. By now you should be fine leaving the strawberry outside at night. They are frost hardy, though the flowers can get damaged by frost. But by now you should have night-time temperatures consistently well above freezing. So leave them outside if you're able. You could split the plants up into their own pots, but you may risk shocking the plants and risking this year's fruits. It really depends how well rooted they are - you may find it's easy to pot them on without disturbing them too much and having to tear at the roots. Otherwise I'd leave potting them up into individual pots until they've finished fruiting. Once they are completely finished fruiting, you can cut back the old foliage, leaving the new leaves right at the center of the crown intact (other new leaves will then sprout). They can be divided after cutting back - just try to keep the roots as intact as possible - cutting back some of the older foliage will help. Keep them watered as they settle back in and use fresh potting soil. Ideally you'd then do any future splitting or potting on in the winter, while the plants are dormant." "My plants are now three years old and I plan on replacing them next year. however I have noticed that a few have got a grey slime at the base of some of the plant branches. Am I right in believing this is the larvae of a bug that will eat the plant once hatched. If so what can I do to prevent this from happening? E-mail address in case I can't access this site is:-"
"Hi Graham. It could be larvae or it could be that the stems have rotten or got some sort of plant disease. Either way, the best way to avoid problems is to plant your new strawberry plants into a new patch of ground or fresh potting soil/compost. That way you won't have any complications and the plants will be rooting into fresh ground that will better support healthy growth while avoiding any build up of pests and diseases." "I have a tub that is no longer producing flowers or fruit but is throwing lots of runners. Should I cut them off?" "I have potted on runners that are now producing roots, so I have cut them free from the main plants. I now have 16 new plants. What do I do next, both with the original plants growing in containers and the new plants growing in 4 inch plastic pots. I have put the pots in my greenhouse until I find out what to do next. The original plants are outside on a solid surface. Regards, Derek H."
"Hi Jane. It depends how old the plants are. If they are more than three years old I would consider propagating these runners to make new plants, then discarding the old plants. This is assuming the mother plants are healthy and disease-free. If the strawberry plants are still quite young and vigorous and have merely stopped producing flowers and fruits for this season, then continue to cut off the runners so the plants continue to recharge and bulk out for next season. Leaving one runner to grow from each plant, and propagating from this, is a good compromise should you want to increase your total number of plants." "Hi Derek. If the original plants are old and have started to tail off production, then you can discard them onto the compost heap. If they are still growing well then tidy the plants up and allow them to recover for next year. The propagated runners can be planted into fresh ground whenever they have filled out their plastic pots with roots. Or leave them in the greenhouse over winter to grow on a bit more, then plant out early next spring. Check out our article and video on propagating strawberries from runners - do a search in the top-right of the web page to find it." "I have 4 hanging baskets of strawberries and would like to plant them in the garden before winter. Would this be worthwhile? We have very severe winters in Northwestern Ontario, Canada and I am unsure on how to winter them." "Hi Darlene. I think the winters may simply be too severe in NW Ontario. Strawberries generally go down to about USDA zone 4, with mulching over winter to protect them. I think the preferred option would be to pot up your strawberries into fresh potting soil into pots, which are then kept in a greenhouse if you have one. They can then be placed back outside, in bigger pots or planted, to fruit next summer." "Is it possible or desirable to grow strawberries in roof gutters attached to the fence. This way I could get several linear metres of garden in no space at all. Would the depth of potting mix in the gutter be adequate for the plants"
"Yes, this is possible and a very attractive way to grow strawberries. However, you'll need to either be on hand to water most days when it's warm, or to set up a micro irrigation system to keep them all watered. Gutters look great because the fruits then hang down away from the gutters for picking." "Due to the very hot spring we had most of our strawberry plants dies this year while we were on holiday and we need to replace them. We usually buy bare roots by mail order and just got an email saying that we should buy them now to get a good crop next year. Your article suggests they are planted in late spring early summer. Does that mean we will not get any straweberries if we plant them next year ? and would it be a bad idea to plant them in the autumn. " "Hi Joanne. Sorry to hear about your loss of strawberry plants - that's very frustrating but a good excuse to buy a nice variety of new plants. Make sure you plant them up into fresh soil/compost. Autumn is also a great time to plant strawberries. The plants will get settled into position and send out new roots before the winter arrives. This means they'll have a good head start next season and will be raring to go. They should get plenty of strawberries next year as a result too. So yes, do go ahead and plant them this autumn." "thank you so much Ben, it is hard to get advice on gardening. I live in France and have the following options of strawberries I can purchase locally as bare roots. I would like a large sweet strawberry that gives over several months, are there any of these you could recommend ?Angelina, Asia, Ciflorette, Cirafine, Clery, Flair, Cherry berry, Madame moutot, Gigantella , Gariguette, Malwina, Ruby des jardins, sengana"
"Hi Joanne. The only variety I have experience of is 'Gariguette', which produces large, very sweet fruits of exceptional flavour. It's described as 'early' though, and would only crop over, say, six weeks. To get fruits over a longer period you'd really need to plant several varieties, to get that overlap." "I have a strawberry plant I started in a pot. They grow natural in my back yard, but are always tiny and rotten by the time I find them, so I picked one and put it in a pot. It's growing great, but here in Upstate NY the winters are brutal. What do I do with this once winter gets here? It's still on my porch outside. I read if I keep cutting the tenacles it will grow alot of roots, which I guess is needed to bear fruit? I haven't had any fruit yet, but I keep cutting the long things that are growing. I am not cutting the leaves. " "Hi Kim. The long tentacles are called 'runners'. These are best cut off, as you are doing, so that the plant concentrates its energy into growing strong roots and bulking out. You can use runners to propagate new strawberry plants, but it sounds like you have plenty of strawberry plants you can dig up and pot up anyhow. The foliage will die back over winter - you can just cut this off. New shoots will emerge again in spring. 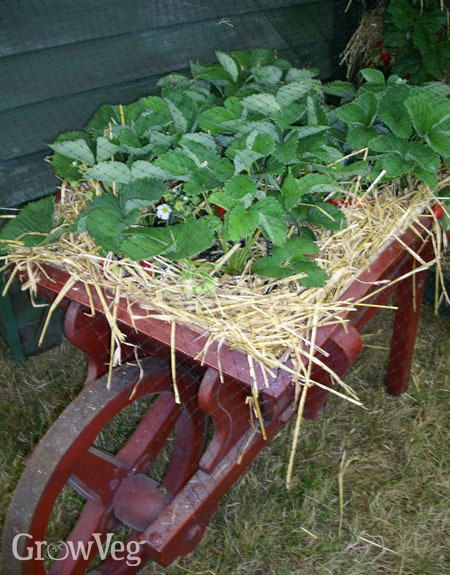 Strawberries are hardy where you are, but it may be a good idea to move your plot to as sheltered a position as possible - perhaps up against the house - to minimise the time the pot is frozen solid." "Thanks Ben. So leave the pot outside on the ground?? Should I put mulch around it? " "Hi Kim. Apologies for late reply to your follow-up question. I would think that as long as the location for your pot is sheltered somewhat, you wouldn't need to put mulch around it. The pots can stay out of the ground." "Hi I know this is an older post but I was impressed with the information you gave I am new to growing and I am curious if you can take strawberries indoors during the winter if they are in containers because I do not have a green house." "The variety I have is ozark beauty which is ever bearing thank you." "I have one healthy strawberry plant in a pot. Can I leave it on our screened-in porch with other house plants or must it be outside for bees to polinate?" "It would need to be outside for the bees to pollinate it, so yes, put it outside if you’d like some strawberries." "For getting rid of slugs and other pests, I was so thankful to find out about diatomaceous earth. I bought a 20 lb bag for $10 at Tractor Supply. Be sure to buy food grade. It is a fine dust that you sprinkle on leaves and around your crops. Completely natural and not harmful to humans or animals!" "Thanks for the this tip Ann, appreciated." "Is it too plant to plant strawberry's and when should I start planting potatoes ? " "Is it too late to start planting strawberries ?" "Yes, great fun when things fill those nasal passages. Made me run right out to plant those plants. " "Hi Annette. No, you can plant strawberries at any time of year. They may not produce fruit in the first growing season if they are planted quite late, but that will at least give them plenty of time to get strongly established ready to fruit in profusion next year." "Hi, thanks for the great information. I planted 3-4 strawberries 4 years ago and now I have around 12-14 plants. How to know which one is the mother and which one the new ?" "Hi Sara. The mother plant will either be the largest or oldest looking - it will usually look a bit more tired than the others! If you can't tell, just keep the most vigorous-looking plants and remove those that look less vigorous or are struggling. It's not an exact science, but the most vigorous plants, with the most fresh growth, will probably be the youngest and most likely to crop." "I purchased 2 different types of plants, one was supposed to be everbearing, I planted them in the Miracle Grow potting mix and did get a few berries but then they stopped producing, the one type sent out lots of runners early and the everbearing has just started to send out runners. It has been extremely hot and the plants tend to droop if they are not watered twice a day. Was very disappointed with them and wonder if I can transplant them into the ground this late in the year and do something so that I have better luck next year. " "I bought strawberry planter, can I keep them from year to year? Can I winterize them in my house ???" "Hi Pat. Yes, absolutely you can plant out your strawberries into the ground, so long as you ensure plenty of the potting soil around the roots is also transferred to ease the transition. And you'll need to keep plants watered as they establish. In-ground plants ultimately need less watering than container-grown plants, so there will be less pressure on you to keep them hydrated continuously too." "Hi Nicole. Yes, strawberries can be kept over from one year to the next. They can cope with some frost, so unless it's very cold where you are, I would keep them outside. If it is frigid though, give them some protection - a greenhouse or cold frame or, if you don't have those, in the coldest room in the house. Strawberries do need a period of cold to initiate next year's flowers though, so bring them indoors as late in the season as you can (a few frosts is fine) so that they have had a good cold spell first. If you bring them inside you may find they flower and fruit much earlier, with fruits ready by mid spring after taking them back outside." "I've been told plucking the early flowers will produce a better crop later. What do you think?" "Newly planted, very young strawberry plants are best left to establish rather than set fruit, so you may be best keeping these from flowering then setting fruit. But for established plants I’m not familiar with the practice of picking off flowers for a better later crop."